Corps Water Management System (CWMS) Upper Missouri River Tributaries | WEST Consultants, Inc. The Corps Water Management System (CWMS) is the automated hydrometeorologic data, modeling, and communication system used by the U.S. Army Corps of Engineers (Corps). Real-time data include river stage, reservoir elevation, gage precipitation, and quantitative precipitation forecasts (QPFs). Hydrologic models are run based on these inputs and appropriate reservoir operations can then be determined. WEST Consultants was selected by the Corps’ Hydrologic Engineering Center (HEC) to develop new CWMS models for three watersheds in the upper Missouri River watershed: James River above LaMoure, ND, South Platte River above Henderson, CO (including Denver), and Fall River above Hot Springs, SD. The CWMS models for each watershed include HEC-HMS (Hydrologic Modeling System) models and the Denver model also includes a HEC-ResSim (Reservoir Simulation) component. The James River, ND CWMS model tasks included developing and calibrating an HEC-HMS model upstream of LaMoure, ND and performing real-time testing of the completed CWMS. The HEC-HMS model includes snowmelt processes, which is the principle source of flooding in this 4,300-square mile basin. 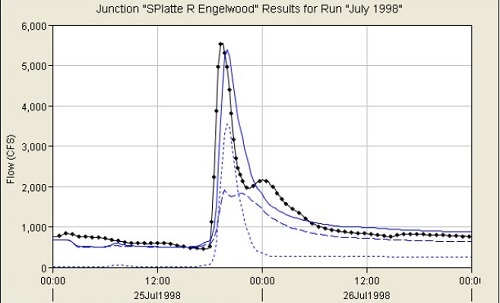 The South Platte, CO CWMS model tasks included developing and calibrating an HEC-HMS model upstream of Henderson, CO (2,200-square mile basin), developing and testing an HEC-ResSim model for three major dams/reservoirs in the watershed, and performing real-time testing of the completed CWMS. The Fall River, SD CWMS model tasks included developing and calibrating an HEC-HMS model upstream of Hot Springs, SD (140-square mile basin) and performing real-time testing of the completed CWMS.